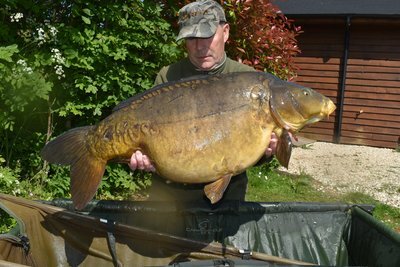 Two more 30+ Carp create the 87th and 88th members of the Cherry Lake 30+ club! Malcolm Dix. New PB. 39lb Mirror. The run of big fish continued last weekend when regulars Alan Collier and Malcolm Dix made their annual ‘pilgrimage’ to Cherry Lakes. Not only did they enjoy the fabulous weather, but they shared 5 Carp between them when they stayed in Grebe Lodge on Cherry Lake. The biggest was this fabulous Mirror below of 39lb which was caught mid morning on Sunday from close to the far reed bed. The Carp fought very hard and it was a much relieved, and quickly extremely pleased, Malcolm when the Carp finally graced the bottom of his landing net! Not surprisingly this was a UK PB for Malcolm. This Carp last came out in October 2017 at a similar weight. I was not too sure to be pleased or disappointed (as this was one of the Carp I thought might break the 40lb barrier) when I weighed her? Dave Bowen the fishery manager tells me to be pleased after such a long winter! Malcolm becomes the third recipient this year of the new 35+ Cherry Lakes hoodie as well as the 87th member of the Cherry Lake 30+ club. The newest member, who becomes the 88th member of the 30+ club is however Jack Lyon who landed a delightful Ghost Mirror of 30lb last night. 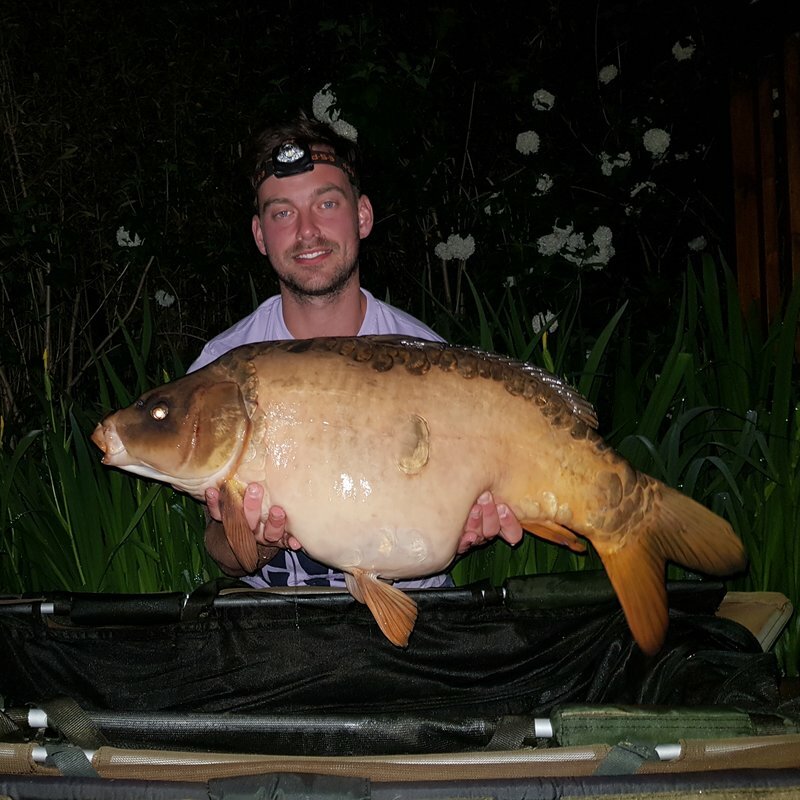 Jack was sensibly fishing close to the Lodge out of the way of spawning fish, and at 23.00 he landed his first ever Carp from Cherry Lake. What a cracker too! This is the first time this Carp has been caught at 30lb. It was last out in July 2017 at 28-04. This means we have now had 5 Carp over 30lb caught in the last week including two over 35lb. Nice! The Carp have been spawning for the last two days in Cherry Lake, Cherry Mere and Cherry Springs. With the weather forecast good for the next few days I am really hopeful that the Carp will fully ‘spawn out’ over this period. Whilst this is bad luck for this week’s guests, all of whom I am delighted to say are fishing very sensibly and not casting anywhere near the margins where the Carp are spawning. I am hopeful that a few really good spawning days should mean that there are no further spawning sessions this year. This is good for the Carp (much lower levels of stress) and future guests.